It’s almost time for the national conference in Seattle, and I hope to see many of you there. The program is strong, with sessions covering all aspects ofyour career, from just beginning to retirement. I know I’m looking forward to getting out of my 10×10 home office (and toy room — I’m not sure ofthe ergonomic benefits of using a box of wooden trains as a footrest) and spending time with other indexers! I’ll save a seat for you at breakfast Wednesday morning, too. This is my last newsletter before stepping down as Chair. Chair-Elect Judith McConville has been an invaluable help to me this past year, and I know the chapter is going to flourish in her more-than-capable hands! With that said, we do need nominees (or volunteers) for a few positions: Chair-Elect and Secretary-Treasurer. This second position is a combined one, due to the low demands, and comes with a three-year term. Chair-Elect has a one-year term, followed by a one-year term as Chair. Please consider sharing your time and expertise with the chapter. This is a great experience for a relatively new indexer, so don’t hesitate on those grounds! Contact me at meghan@millerbrawley.com. You can view the detailed duties here. A huge thanks to our long-serving outgoing Secretary, Estalita Slivoskey, and our outgoing Treasurer, Kay Schlembach. Both have been an essential part of the MSA chapter for many years, and we appreciate all your help! In other news, I’ll be transitioning much of the newsletter to our website, and using the blog function. That will enable us to get information out in real time, although we will still send emails as well. Make sure you’ve been added to the MSA-ASI Yahoo list, and that you’re getting emails from the @msasindexing.org domain in your inbox. I’ll still pull together a quarterly newsletter email, but check our blog so you don’t miss out on any information — Judy has some great opportunities planned for this year! Thanks for reading, and I hope to see you next week. Susan Cohen and Judy McConville in Pittsburgh. An MSA-ASI networking luncheon was held at the Sonoma Grille in downtown Pittsburgh on March 28, 2015. Invitations and reminders were issued via the MSA and Heartland mailing lists, the MSA website and Facebook page and through several of the indexing list serves. Many indexers sent their regrets, and one was forced to cancel last minute due to a health issue. It was a nice event for the three attendees. We spent over an hour chatting about both indexing and life experiences while enjoying a delicious lunch at this trendy wine bar. 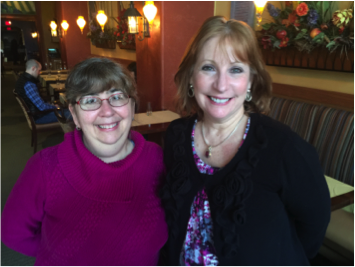 I had the pleasure of meeting Susan Cohen, a former librarian and current freelance indexer who is planning to retire from indexing in 2015. Following the luncheon, 60 informational postcards were distributed at the meeting venues for the Society for Applied Anthropology and the American Copy Editors Society. 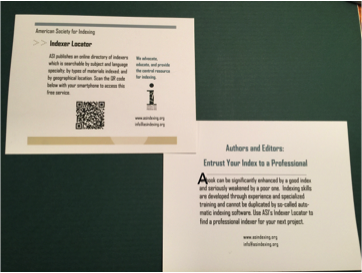 The postcards, pictured on the right, featured the ASI logo and tag line, information about how important a good index is, and a QR code that when scanned with a smartphone will open ASI’s Indexer Locator in the phone’s browser. Hopefully, our goal of spreading the word about the value of indexing and how to locate qualified indexers will be advanced with these handy, easy-to-use postcards. Information postcards handed out at the society meetings. If you haven’t emailed Meghan your contact information, you may not be listed in the MSA Member Directory. We’ll be using this directory to promote MSA indexers, so make sure you’re included and your information is correct. E-mail meghan@millerbrawley.com to update your listing. Help spread the word about the vital role that professional indexers play in the publishing process. How can you do this? By looking for groups that are meeting in your area and distributing literature that helps authors find our website. MSA will supply a PDF copy of an informational postcard. You print the postcard at home or at your local commercial printer, visit the meeting venue and distribute the postcards. The postcards will contain basic information about our chapter along with a QR code that, when scanned with a smartphone, will lead directly to our website. Listed here are a couple of meetings in our chapter area to get you started thinking. You can search the Internet for more meetings in your area. Think about professional societies and writers groups – any event where authors, editors and publishers might be. Want to get started? Contact Judy McConville, MSA Chair-Elect, at judy@awps.biz. Not listed on the ASI website? Contact Meghan Miller Brawley, ASI-MSA Chair at meghan@millerbrawley@millerbrawley.com. Visit sspnet.org to see the exhibitors page and publishers attending. Visit publishers.org for a list of publishers who are members. 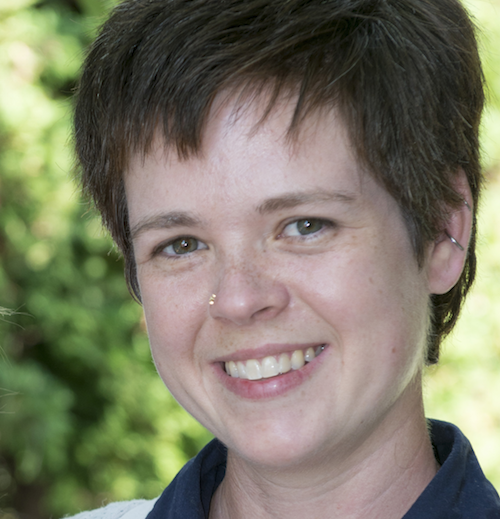 Meghan suggested that the website needs to be better used as a tool. She is working on getting administrator privileges. Meghan has removed the directory from the website in order to update it. She will request updates from members. Judy planned a luncheon/meetup and originally had 2 positive responses, but one person had to pull out due to an injury. She enjoyed lunch with one other indexer. It was mentioned that ASI National has some type of postcard available for this, but Judy was unable to get it in time. Judy is considering two other upcoming meetings to distribute postcards at – one in Philadelphia, and one in Virginia. Have something you want to share? Please let us know!